BAGHDAD, Iraq (CNN) -- Iraqi representatives will meet with the International Olympic Committee on Monday to try to reach an agreement that would allow now-banned Iraq to participate in next month's games, an official said Friday. 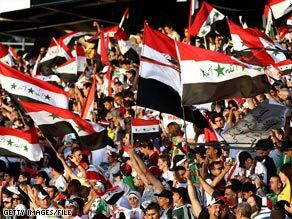 Iraq fans cheer during an Olympic qualifying soccer match against Australia in November. Jassim M. Jaffer, Iraq's minister of youth and sports, told CNN he is "optimistic that we will participate." Iraqi government spokesman Ali al-Dabbagh and the ministry's adviser, Basil Abdul Mahdi, are on their way to Lausanne, Switzerland, to meet with IOC officials, Jaffer said. The IOC barred Iraq from participating in the Olympic Summer Games in Beijing, China, citing what it said was government interference with Iraq's Olympic movement. The IOC's charter does not allow political interference. But even as government representatives traveled to Switzerland, Jaffer said Iraq was considering legal action against the IOC. "We will revert to international courts with a complaint against the IOC ... to get Iraq's rights and the rights of the athletes," Jaffer said. On Friday, another Iraqi government official said the country was doing what it could to reverse the ban, but acknowledged that "chances are slim" for a change. Basam Ridha al-Husseini, an adviser to Prime Minister Nuri al-Maliki, told CNN the government has been in "heavy negotiations" with IOC officials through the Asian Olympic Committee. "The Iraqi government will not give up on our participation, which is still needed by our people," he said in a phone interview from Dubai. "We are doing our best to stop the ban. ... The chances of that are slim, but we will persevere and hope it will happen." Repeated attempts by CNN to reach the IOC press office in Switzerland for comment were unsuccessful. But on Thursday, IOC spokeswoman Emmanuelle Moreau said the IOC in June suspended Iraq's national Olympic committee after the government removed elected officials and put in people not recognized by the IOC. She said the IOC had proposed to the Iraqi government that officials come to the IOC headquarters in Lausanne, Switzerland, "to discuss possible solutions." "We're extremely disappointed with the situation," Moreau said. "The athletes have been ill-served by the government in Iraq." Iraq missed a Wednesday deadline for the entry of athletes to compete in archery, judo, rowing and weightlifting, Moreau said. She said there is a chance that track and field athletes could compete if the original committee is reinstated. The deadline for the track team to register is at the end of the month. Jaffer, Iraq's sports minister, told CNN on Friday that the IOC's decision was "unjust" because it did not take into consideration the Iraqi government's reasons for the May suspension. The minister called on the IOC to come to Iraq and talk to the sports federation to investigate the political interference accusations, and then act accordingly. "Looking at this from far away, without going into the details, not reading the Iraqi government's reports, not hearing Iraq's side of the story and accusing Iraq of many things is really unfortunate," he said. Several Iraqi athletes were to travel to China for the games' start in August. Iraqi sprinter Dana Hussain cried for hours after hearing the news of the ban on Thursday, which arrived in the form of a letter to Iraqi officials. "She hasn't stopped. It's like finding out that a close relative has died," said her coach, Yousif Abdul Rahman. "In this horrible situation," she said, "who can say I'll even be alive in 2012?" Al-Husseini said Iraq had the right as a sovereign nation to suspend the Olympic committee, which he accused of documented corruption. It was not clear where the committee's funds were going and they "could be ending up in the hands of terrorists," he said. "We are satisfied with the decision ... stand by it and we are not going to change an order by [Prime Minister] al-Maliki and the Cabinet. ... Never," he said. He was asked whether Iraq would consider doing what Yugoslavia did in the 1992 Winter Olympics when it was banned -- sending individual athletes and not raising the national flag. Al-Husseini said that would be an option, but al-Maliki rejected it. Al-Husseini said that Iraq had been banned from taking part in the 1990 Olympics during the Saddam Hussein-era because of the invasion of Kuwait. The 1990 ban, enacted by the Olympic Council of Asia, actually was a ban on participation in the Asian Games, a regional Olympics-related event. Iraq participated in the 1992 Olympics in Barcelona, the first Games held after the Kuwait invasion. CNN's Jomana Karadsheh and Morgan Neill contributed to this report.